May my Gurunathan help me (thuna chaika) to keep the auspicious names of Lord continuously on my tongue (naavinmel eppozhum) and to make this human life (narajanmam) meaningful and fruitful!(saphalamaakkituvaan). The only way to to make the human life fruitful and meaningful is to constantly chant the auspicious names of Lord. So, the poet is seeking the blessings of his Gurunaathan to help him retain the naamam on his tongue for ever. Who is Poonthanam’s Guru? He is considering Guruvayurappan as his Guru because Lord is both the remover of the darkness of Anjaanam or avidya (Guru) and the protector and saviour of all (Naathan). After innumerable births in lower species,we finally got narajanmam in Kaliyuga. Kalisantharanopanishad and many other scriptures reinforce the importance of naamasankeerthanam in Kaliyuga. Naamasankeerthanam can be done any time anywhere. We really do not know what happened until yesterday or what would happen tomorrow. Neither we know when this body we see today will perish. When we look at the literal meaning, we may feel like responding: “I know what happened until yesterday and I can roughly guess what will happen in the coming days. I am hail and healthy and unless I get into an accident or so I should be able to live many more years”. Poonthaanam is putting his forefinger on his nose with an expression of “what a pity?” because he meant much more than the literal meaning of yesterday, tomorrow and our present body. He persuades us to think deep about the uncertainty of life. Yesterday and today also means previous janmaas and future janmaas. We do not know about our previous janmaas or good and bad karmaas we have accumulated. A great part of our good and bad experiences in this janma is the direct result of our past karmaas. We cannot undo the sins or suffering by anything other than sincere prayers. Bhagavaan is the only one who can change the results of our praarabdha karmaas and in Kaliyuga, naamasankeerthanam pleases Bhagavan more than anything. We do not know what is in store for us tomorrow. How can we make sure that our future is in safe hands? Only by offering ourselves in His strong and kind hands. Then what about today? At present we live in this body and the moment jeevathma leaves the body, it becomes lifeless like a log of wood. We have absolutely no idea when that will happen. Here Poonthaanam used the word “thati” for body to specifically tell us that body is like a log of wood or worse than a log of wood when it is lifeless. A dead body that is not preserved starts deteriorating in a few hours where as a log of wood may remain intact for several months or even years. Poonthaanam advises us to think deep about these truths and use every moment available to worship Lord with naamams. Chaitanya Mahaprabhu also said that there are no hard and fast rules for chanting naamaas. Anytime one can chant and under any circumstances one is allowed to chant. “Shuchir va ashuchir va sarva avasthaasu sarvada” meaning in any condition clean (purified) or dirty (impure) one can chant the auspicious names of Lord. If Bhagavan wishes, those people whom we see today may disappear (may be dead) by tomorrow. Again if Bhagavan decides, with in a few days (two or four days) a healthy man’s dead body may be carried to the funeral pyre. In the same way, by God’s wish, a king sitting in a palace (maalika) can become a beggar with a dirty bag (maaraappu) hanging from his shoulders (tholil). Poonthaanam explains how transient is our life, wealth, poverty, sorrows and everything that we see in this world. A man walking and having fun this moment can embrace death the next moment. Everything is Lord’s wish! In Kerala, usually a dead body is tied to a wooden ladder or a piece of long wood and carried by relatives (normally by sons) to the funeral pyre. However hail and healthy one may be, when the time decided by Lord approaches, chaitanyam or jeevan disappears leaving the dead body to be carried to the funeral pyre. It can happen any time, in one day, two days or four days (randu naalu dinam kondoruthane). Here Poonthanam used the word “mannan” for king (mannante) because “mannan” also means “drushtan” or “aviveki”. He advises that those people who have money and power should have the vivekam to use both dharmically remembering that they came to this world with nothing and would go from this world with nothing. Bhagavan can take it any moment from anybody. By Lord Krishna’s blessings, Kuchela or Sudama became wealthy overnight. What about Ravana? He lost everything that he held dear and finally he lost his life too at the hands of Lord Rama. Even if we are destined to go through sufferings due to our past karmaas, surrendering to Lord will lessen the negative effects and lead us to Satgathi. “Bagavan says in Gita: “na hi kalyaanakruth kashchid durgathim thaatha gacchathi” meaning “If you do good, it will definitely lead you to satgathi or protect you from any harm”. Poonthaanam tells this truth from his own experience of the tragic and sudden death of his infant son. I have heard several versions of the story. But the following is the one I heard from my parents. Poonthaanam’s son was 5 months old and anna praasham (giving rice for the first time is called “choroonu” in Malayalam and usually it is done either the 5th month or 7th month ) ceremony was fixed. He invited several relatives and that morning after feeding the baby his wife made a bed in the room next to the hall where the ceremony was to be conducted. Usually there will be an entrance to that room from the kitchen also. Baby was sleeping and his wife was busy with all the preparations. It was morning and one namboothiri lady finished her bath and put the wet clothes in the same room where the baby was sleeping. That room was dark even during day time and she did not see the baby and unfortunately wet clothes were put on the baby’s face. ( I can very well believe this because in my house, there is a room on the north side called Vatakkini which is very dark even in day time. So when our parents told us this story, we listened with tears in our eyes and we felt it could happen in any Nambudiri house.) Then the next lady came after bath and seeing the wet clothes in a corner she also put hers on the top of it. One after another a few ladies unknowingly put wet clothes on and around the baby. Nobody noticed and it was about muhurttham time and Poonthaanam asked his wife to bring the baby. She was shocked to see what happened to her helpless baby and we can imagine the rest. This sorrow gave birth to Njanappana and Poonthaanam advises us to realize the uncertainty of everything in this world and persuades us to think of God by continuous chanting of His auspicious names. Some people see this truth, understand it or internalize the truth. But some people cannot comprehend the truth even when they see it everyday. But there are some others who know that all that they see are not real and it is all Maaya. Even though everybody who is born embraces death eventually, the living people refuse to believe that death will eventually embrace them also. What is more surprising than this? Even though we see it everyday we live as if death is only for somebody else. Again Poonthanam indirectly tells us that only with Bhagavan’s blessings we can have this vivekam or power of discrimination. So we should pray Bhagavan to include us in that category of few people (the word “chilar” indicates that these kind of people are rare) who are capable of seeing the truth. In this Kaliyuga, the most doable form of worship is naamasnakeerthanam and he encourages everybody to chant auspicious names to purify our mind and elevate ourselves from the state of Adhama Purushas to the state of Uttama Purushas. Many people (palarkkum) want to know (ariyenam)about all these (including the power of discrimination of human beings, about the mystery of God, how to go beyond Maya and attain salvation etc) and hence so many saasthraas (saathrangal) tells (parayunnu) about or explain these subjects in so many different ways (pala jaathi). Which saasthra or which philosophy appeals to each one depends on each individual’s nature, attitude and circumstances. Some people like certain approach whereas others like a totally different approach. Saathraas contain so many different philosophies to satisfy the varied interests of ordinary people. Just like we all choose different professions or jobs for the sole purpose of survival, different people accept different saasthraas to advance spiritually and increase the awareness of parmaathma chaithanyam or God. There are Vaishnavaas, Shaivaas, Shaaktheyaas or another group who worship all 33 million gods alike etc. Goal is the same and only paths are different. There is a saying that “vitthamaeva param nrunaam janmaachaarakalodaya:” meaning people choose different ways and methods for the sole purpose of acquiring wealth. Outwardly each and every philosophy may appear different, but once the essence is understood, the differences slowly disappear and all the paths unite to become one path. The word Saasthraas (saathrangal) is used because they advise to follow certain restrictions and rules to advance smoothly in the spiritual path. How is it possible to choose the right path and who will guide us through? 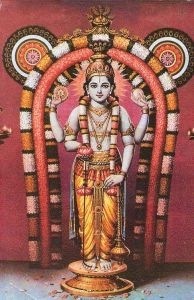 Poonthanam has only one solution: chant the auspicious names of God and He will guide us through the right path. Just like the diversity of the world and its inhabitants, saasthraas also are diverse. Different types of yanjaas, poojaas, and homams are described very clearly in many scriptures. Initially even though devotees perform them with some specific desire, as the Bhakthi bhaavam matures, Bhagavan’s blessings help them to do Nishkaama karma or do karma with out expecting anything in return. There is a small conversation between Jabali Muni and a vartthaka or business man called Thulaadhaara. Even though Jabaali Muni was an embodiment of kindness, he was proud of his achievements and considered himself as the greatest Dharmishttan. Then he heard an ‘ashareeri” or wise words from God to visit Thulaadhaara. He visited him and Thulaadhaara explains to him how we all should do our swadharmam with out expecting anything in return. Thulaadhaara told him that Yanjaas and poojaas are done to show our gratitude to God, Forefathers, Rishis and other Maahaathmaas for what blessings they have already bestowed on us. Renunciation of the results of the karma is nishkaama karma and Nishkaama karma purifies our mind. God’s chaithanyam gets reflected only in pure minds. Maharshi Kapila’s Saankhya philosophy regards Universe as consisting of two eternal realities Purusha and Prakriti. Pathanjali Maharshi’s yoga saasthra describes different types of yogas like Hatha yoga, Raja Yoga etc. They all lead one to the knowledge of Brahmam, but those paths are very difficult and with out an able Guru (in every sense of the word) it is impossible to follow those paths. But in this Kaliyuga, Bhaktha Kavi Poonthaanam advises us to set aside those difficult paths (which are as sharp and dangerous as the edge of a razor) and follow the most simple and enjoyable path of Bhakthi or devotion. What is the first and final step in the path of devotion? Naamasankeerthanam. Bhakthi starts with Naamam and ends with Naamam. It is for ordinary people as well as for self realized souls. No question of whether you are authorized, whether you have enough knowledge to pursue or whether you have the right comes into question in this way of worshipping Lord. Anybody can do naamajapam, anytime, anywhere.